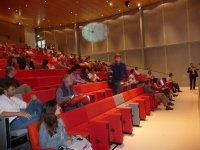 The 7th international conference on methods and techniques in behavioral research was held in Eindhoven, The Netherlands from 24-27 August 2010. Almost 400 participants enjoyed four days packed with inspiring keynote lectures, symposia, tutorials, workshops, scientific tours, and pleasant social events. Keynote speakers: Kerstin Dautenhahn, Naotaka Fujii, and Scott Makeig. Symposia on Measuring surgical behavior, Automated identification and quantification of non-rodent behavioural phenotypes, Ambulatory recording of psycho-physiological signals: platforms and applications, Improving sports performance, Measuring (ambient) persuasive technologies, and many more. Tutorials on Analysis of behavior using operant conditioning methods, Behavioral research and digital video, eye tracking, Psychophysiology applications using a BIOPAC MP system, and much more. User meetings on The Observer, EthoVision, CatWalk, and Theme. Scientific tours to research facilities in Eindhoven. Social events where one can meet colleagues while enjoying another side of Eindhoven and its surroundings.